For more information about the vehicle battery, see Battery. If the battery has run down, try to use another vehicle and some jumper cables to start your vehicle. Be sure to use the following steps to do it safely. They contain acid that can burn you. They contain gas that can explode or ignite. They contain enough electricity to burn you. Ignoring these steps could result in costly damage to the vehicle that would not be covered by the warranty. The jump start negative post and positive post are on the discharged battery on the driver side of the vehicle. The jump start positive post and negative post are on the battery of the vehicle providing the jump start. 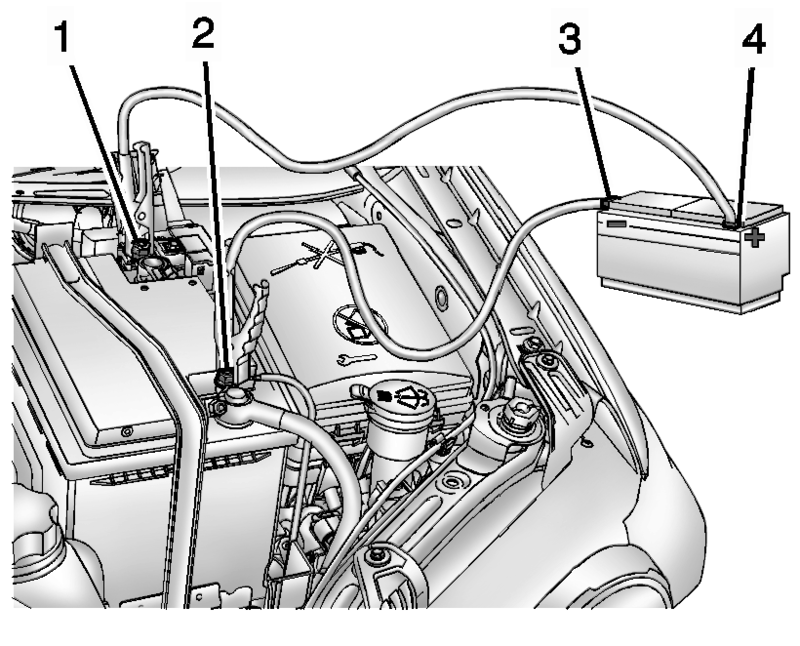 The positive jump start connection for the discharged battery is under a trim cover. Open the cover to expose the terminal. Check the other vehicle. It must have a 12-volt battery with a negative ground system. Only use a vehicle that has a 12-volt system with a negative ground for jump starting. If the other vehicle does not have a 12-volt system with a negative ground, both vehicles can be damaged. Position the two vehicles so that they are not touching. Set the parking brake firmly and put the shift lever in P (Park) with an automatic transmission, or Neutral with a manual transmission. See Shifting Into Park with an automatic transmission, or Parking with a manual transmission. If any accessories are left on or plugged in during the jump starting procedure, they could be damaged. The repairs would not be covered by the vehicle warranty. Whenever possible, turn off or unplug all accessories on either vehicle when jump starting the vehicle. Turn the ignition to LOCK/OFF. Turn off all lights and accessories in both vehicles, except the hazard warning flashers if needed. Using a match near a battery can cause battery gas to explode. People have been hurt doing this, and some have been blinded. Use a flashlight if you need more light. Connect one end of the red positive (+) cable to the positive (+) terminal on the discharged battery. Connect the other end of the red positive (+) cable to the positive (+) terminal of the good battery. Connect one end of the black negative (?E cable to the negative (?E terminal of the good battery. Connect the other end of the black negative (?E cable to the negative (?E post for the discharged battery. Start the engine in the vehicle with the good battery and run the engine at idle speed for at least four minutes. Try to start the vehicle that had the dead battery. If it will not start after a few tries, it probably needs service. If the jumper cables are connected or removed in the wrong order, electrical shorting may occur and damage the vehicle. The repairs would not be covered by the vehicle warranty. Always connect and remove the jumper cables in the correct order, making sure that the cables do not touch each other or other metal.